As my two year anniversary of being a stay-at-home parent approaches, I realized I have learned many things. I’ve stepped up to the plate and tackled the nitty gritty household chores of cleaning, grocery shopping (with coupons), and laundry. I’ve duked it out in the kitchen preparing meals every day for my family. I’ve faced my insecurities to take Ellie to storytime, Japanese school, museums, and the zoo. And in the process, my confidence has soared leaving me to believe I can and will face any situation without fear or uncertainty. But there comes a day when something takes you by surprise and knocks you off the horse making you wonder, “Do I really have what it takes?” Well that day arrived for me. We ran out of toilet paper. I don’t remember the last time I’ve purchased toilet paper. It’s just never been on my list of responsibilities. When I lived with my brother in college, although I did my fair share of grocery shopping, I never bought toilet paper. And post college when Aya and I lived in an apartment, I still grocery shopped, but it was just never on the list when I went to the store. When we moved to our house, Aya was the primary grocery shopper coupon holder until I took over two years ago. So once again, I never had to buy it. Not only have I never bought toilet paper in the two years I’ve been the primary grocery shopper, I have no memory of buying it ever. So you’re probably wondering, if I didn’t buy any toilet paper in two years, who did? The answer; nobody. Aya had enough toilet paper on reserve to get us through to the end of the Mayan calendar. Well, almost enough to get us through the end of the Mayan calendar. Aya doesn’t like clutter and hang on and store things, but she is a hoarder when it comes to a few things. Travel size shampoos you get from hotels (she has a whole drawer full of them because “you never know”), toothpaste, razors, magazines, and toilet paper. You know, the essentials. Luckily, our shortage was noticed before it was too late. 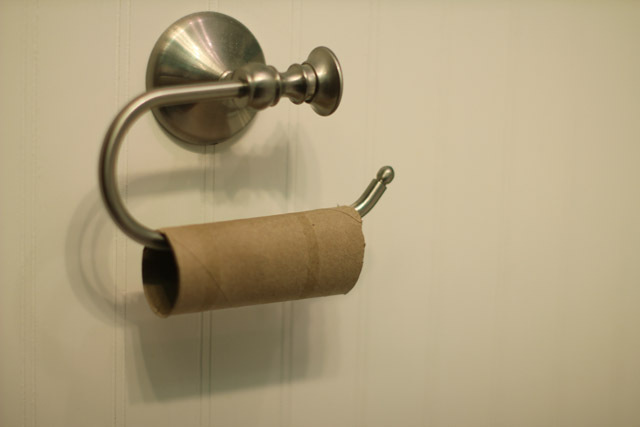 You know, when you’re past the point of no return and the panics sets in after you notice an empty cardboard tube on the TP holder and no one is home. I’m glad to say that Aya has a good pulse on the toilet paper situation in the house so that didn’t happen. She’d announce the TP report like a warning as our stash started to dwindle. “Just so you know, we only have 7 rolls left,” she’d say. “I’ll just pick it up after work,” she said while shaking her head in disapproval. Personally, I think she likes being the TP Sheriff and wanted to get it from the store herself. That doesn’t bother me one bit. 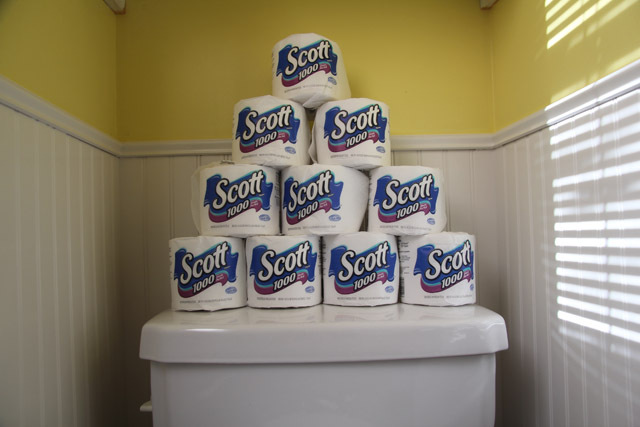 And now we do have enough toilet paper to last us through the end of the Mayan calendar. I conquered cooking, cleaning, coupons, cloth diapers, nap schedules, and sewing class, but toilet paper? Well, you can’t win them all. I guess you could say, I got TP’d. Well, when they sell toilet paper in 80 roll bags it’s pretty easy to forget how many you have left. We get ours from Costco so that we only have to get it about twice a year. Wait… TP does not just magically show up? I have a lot to learn I guess… At least through reading up on this site I can stay in the know on these things…Thanks for the great read!! !